CardioSecur Pro is a mobile, 22-lead ECG requiring only four electrodes for medical personnel. 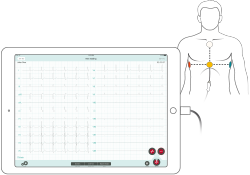 It is connected to your iPhone or iPad, and achieves much more than a standard 12-lead ECG. 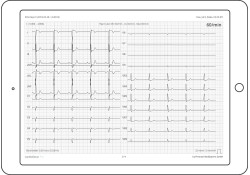 In addition to complex arrhythmias, CardioSecur is the only system that makes it possible to diagnose anterior, lateral, and posterior wall infarctions of the heart. Record a mobile, clinical-quality ECG with only 4 electrodes, an ultra-light cable, and an app. Up to 22 leads make the diagnosis of anterior, lateral, and posterior wall infarctions possible. Avoid the high investment costs of a standard 12-lead ECG device with our flexible feature and price model. Data transfer and storage occur in strict compliance with the federal data protection act (BDSG) and the new EU GDPR. CardioSecur was designed specifically for medical personnel. It is ultra-lightweight (50g), uses only 4 electrodes, and runs via an app, making it one-of-a-kind worldwide. Like the “brother” of the stethoscope, CardioSecur is used where it is needed: directly by the patient. 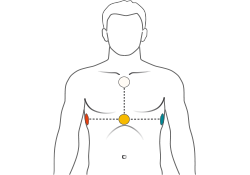 CardioSecur uses vector electrocardiography and 4 electrodes to create a tetrahedron of the thorax, which makes a 360o view possible. Guidelines recommend including examination of the posterior heart wall when ischemia is suspected. The addition of leads V7-V9 and VR3-VR9 makes CardioSecur the only system to be compliant with this point of the guidelines. Via the 22 leads, classic NSTEMI’s can be classified as STEMI’s. With the approved medical device (class IIa) CardioSecur Pro, an NSTEMI can become a STEMI. Conventional, high-quality, 12-lead ECG devices often require investment costs of €5,000 or more. The booked features are unable to be changed during the lifetime of the device. On the other hand, CardioSecur offers a flexible feature and price model. You avoid high up-front costs and have significant savings over time. Additionally, you have the option to flexibly change your features or cancel our service without stating a reason and keep your device beyond.